Where can I learn to be a vegan cook? Where can I learn to cook vegetarian? How can I take my vegetarian cooking to the next level? The best way to improve your cooking skills is study and practice. Most of the cooking classes below are online. The best feature of vegan cooking classes online is that you can do them from anywhere, even if you live somewhere where plant-based cooking classes aren’t available, you travel a lot or any other reason. Most of them allow you to work at your own pace as well. If you’re looking for vegan cooking lessons, these vegan classes are the best way to uplevel your vegan cooking skills. Learn to cook vegan meals that will satisfy all. 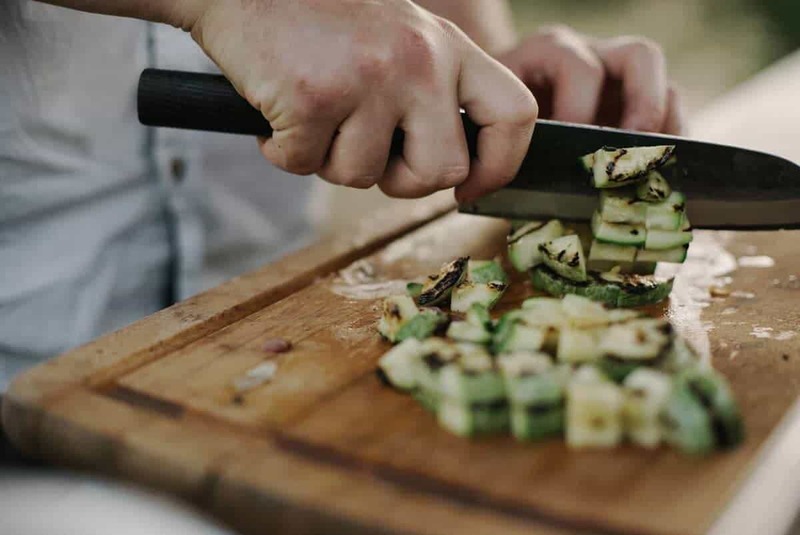 Ranging from courses teaching you how to cook vegan dishes and organise your kitchen to pro-level classes that teach you knife skills and other chef-type expertise, these vegan courses appeal to all levels and aims. School of Natural Cookery 6 months (individual classes). 8 months for Certificate. Pro/chef level (or those wanting to be) From $260 for individual classes. 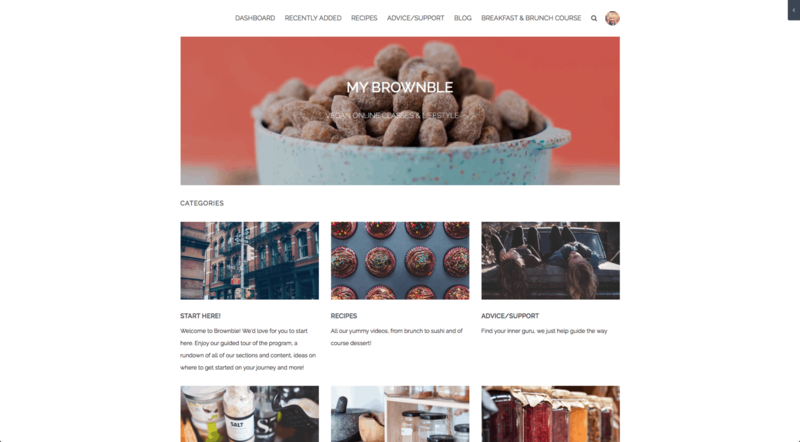 Brownble’s vegan cookery course is my top pick for home cooks looking to learn vegan cooking basics, organise their kitchen and their cooking and improve their relationship with food. 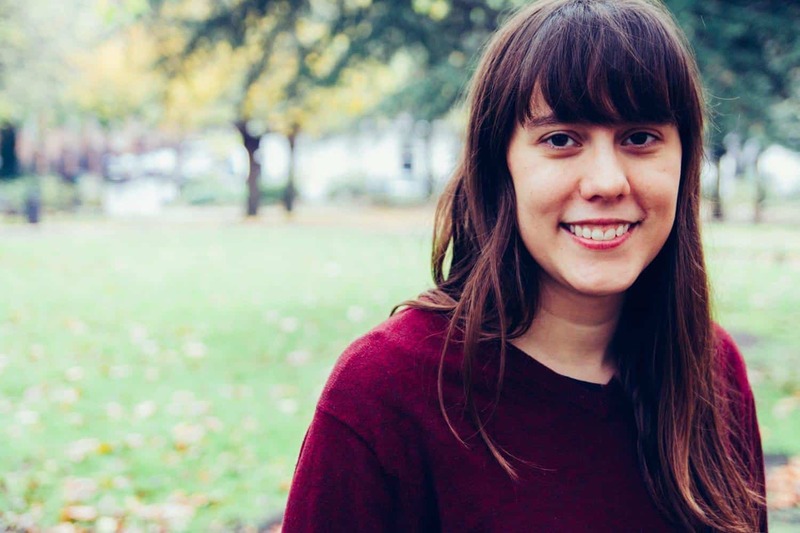 Kim, the certified plant-based cook and mastermind behind Brownble’s cooking course runs one of my favourite vegan cooking sites around, and best of all, she has an incredible patience and a wonderful way of explaining things, likely in part due to her teaching experience. When you join Brownble, you’ll get access to more than 300 vegan cooking videos for every meal of the day and all kinds of different cuisines (including raw and gluten free recipes), with new recipes coming out every week! You’ll also get printable PDFs of every recipe. Best of all, Kim teaches you how to organise your kitchen, meal prep and even to improve your relationship with food, if you’ve experienced difficulties in the past. My favourite part is how affordable it all is! The most affordable option on this list, Brownble is based on a monthly fee. Also great for vegan cooking gifts, you have the option of gifting a membership of 3 months, 6 months a year or a lifetime (find out more about gift memberships here). Click here to find out more about the Brownble vegan cooking and lifestyle course. The School of Natural Cookery takes a completely different approach to plant-based cookery than most. Founded over three decades ago, it pioneered an 'intuitive cooking' approach that is based on learning techniques of working with whole, local ingredients rather than using recipes. If you'd like to learn how to develop recipes based on ingredients from your local farmer's market, based on whole food, plant-based cuisine, then the School of Natural Cookery is for you. With the intuitive cooking technique, you'll learn how to prepare meals using whatever ingredients you have in the fridge. There are two course options: the self-study lifestyle classes or Foundation Certificate. The lifestyle vegetarian cooking classes are plant based, all based online and available for 6 months to complete at your own pace. The Foundation Certificate also takes place online but includes a few in-person vegan cooking workshops (choose between Boulder, Colorado or Portugal, if you're looking for a vegan cooking school in Europe). Although the Foundation Certificate covers the same material as the self-study lifestyle classes, you will be expected to turn in assignments, you'll be assigned a web instructor and will commit to weekly web meetings. The self-study vegetarian cookery courses look ideal for a home cook, while the Foundation Certificate seems to me best suited to those who wish to pursue a career in food, whether as a cookbook author, private chef or vegan restaurant chef (great since vegan chefs are one job in demand in the UK). If you're interested in the Foundation Course, on the other hand, note that it usually starts in February and September and you need to apply at least one month before the start date. One aspect of the School of Natural Cookery that differs from other online cooking courses is that it's a licensed, private vocational school with the state of Colorado. Click here to find out more about the School of Natural Cookery courses. Rouxbe is a a leading online course provider (running online cooking classes since 2005) and their vegan cooking school online is perhaps the best known provider of online vegetarian classes. 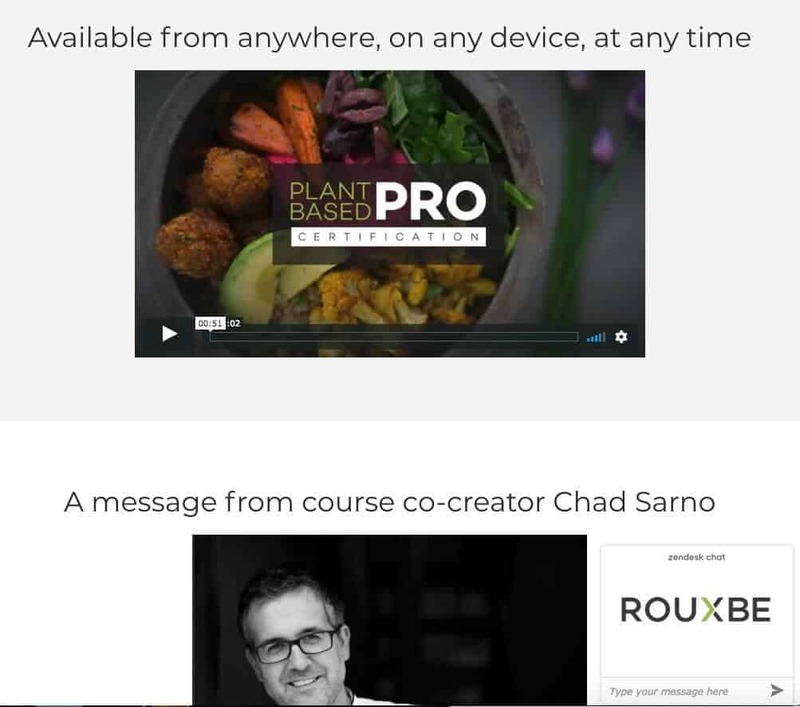 Rouxbe's Plant-Based Professional course was co-created by vegan chef Chad Sarno (one of the leading plant-based chefs, co-founder of Wicked Kitchen and chef behind Saf, which was London's best vegan restaurant before it closed, and still ranks as one of the best vegan restaurants I ever ate in). All the vegetarian cooking lessons take place online, meaning you can complete the course from anywhere in the world. You'll receive lifetime access, but to receive a Certificate of Completion, you'll need to finish the course and all assignments in 6 months. The Rouxbe plant-based course contains over 200 videos on cooking vegan. 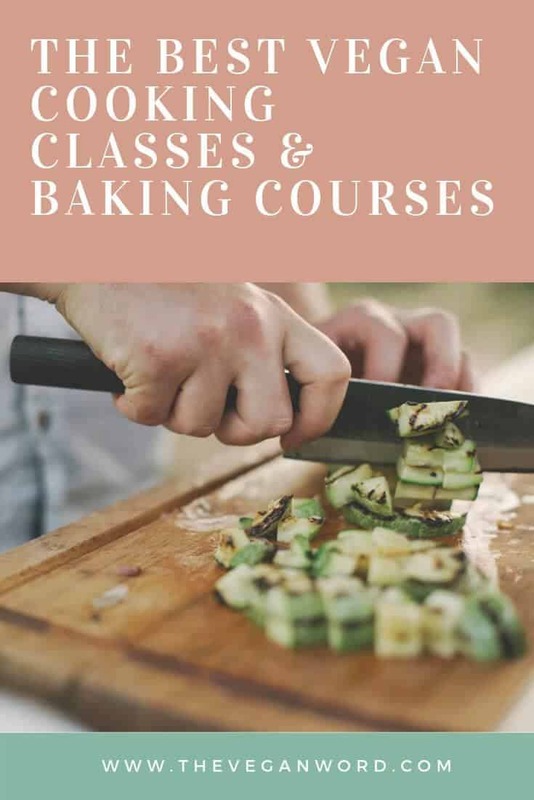 Classes run over the course of 18 units, with more than 85 lessons, teaching you critical cooking techniques. You'll receive personalised instructor support and grades, so you can ensure you're making progress. As well as learning the basics of vegan cooking techniques, lessons focus on raw food, oil free cooking and gluten free. To earn Rouxbe Plant-Based Certification in 6 months, you should expect to dedicate around 12-15 hours per week for studying and practice in the kitchen. Best of all, you can start the Rouxbe Plant-Based Professional course at any time. Once you sign up, you'll receive immediate access. Tuition is $1,299.99 and there is an option to pay in installments. One thing I like is that you aren't charged extra for opting to pay in monthly installments, it's completely interest-free. Click here to find out more about the Rouxbe Plant-Based Professional certification course. The simple plant-based meals class on Udemy will show you the vegan cooking essentials and how to prepare some simple vegan meals. Designed with beginners in mind, this plant based cooking course covers everything you need to get started in the kitchen, from how to cook grains, legumes and vegetables to meal templates you can adapt to your own kitchen. I also recommend if you're a beginner you make sure your kitchen is fully stocked with the essential vegan kitchen tools. If you're already a good cook and you're looking to improve your skills, I'd recommend choosing another course from this list, but if you're at square one, and looking for basic vegan cooking tips and to learn how to get started in the kitchen, then this course would be a good fit. Udemy, one of the biggest online class providers, offers this vegan cooking course. Online learning on web-based platforms like Udemy have the advantage of being accessible from anywhere, and the Simple Plant-based Meals course also offers lifetime access. The class consists of 7 hours of video content, 68 downloadable resources and one practice test. Click here to find out more about the Simple Plant-based Meals class on Udemy. The raw vegan class on Udemy is perfect if you're looking for healthy cooking classes online that will show you how to cook raw, vegan food. Raw vegan cooking classes teach you how to cook your food (or rather how not to cook your food) by preparing fresh vegetables, fruits, nuts and seeds without heating them above 48 C/118 F.
The raw vegan class consists of 2.5 hours of videos, 19 downloadable resources and you'll get lifetime access on Udemy, one of the bigest online course providers. Click here to find out more about the Raw Vegan Class on Udemy. Looking for free online vegan cooking classes? Kim at Brownble offers a FREE vegan breakfast and brunch class! It's hard to find good online vegetarian cooking classes. Free ones are even harder to come by. The vegan classes at Brownble are the best! If you want to learn how to make vegan breakfasts and brunches that will satisfy the whole family, look no further. 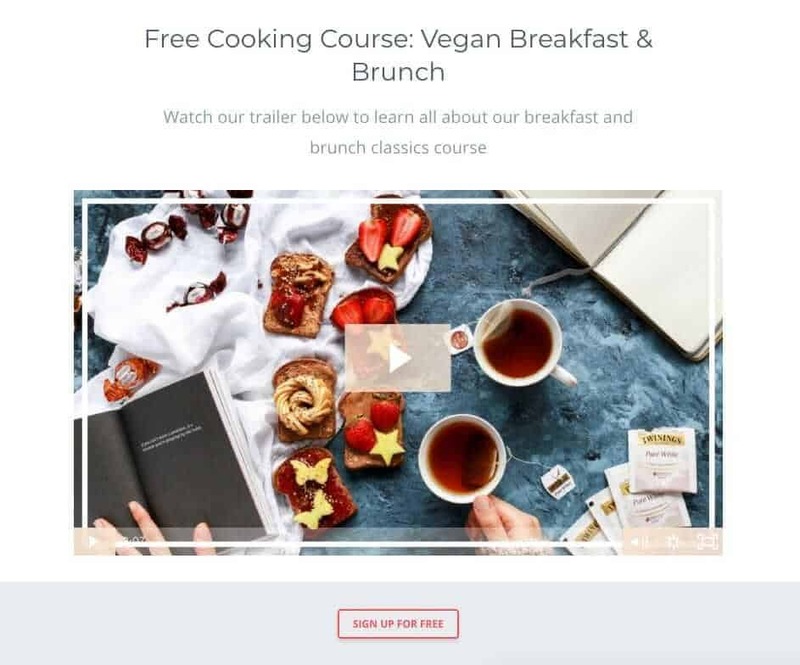 Click here to find out more about the free vegan breakfast and brunch classics class on Brownble. The Foundation Course is the School of Natural Cookery's vegan chef training. This vegan chef school is based in Boulder, Colorado but most training takes place online, along with a handful of required vegan workshops (you can choose whether to attend these in Colorado or Portugal). One aspect that sets it apart from other culinary schools is its 'intuitive cooking' approach which teaches the building blocks of cooking, but not recipes. You'll learn to create recipes out of whatever you have available. As an accredited vegan culinary school, the fact School of Natural Cookery is a licensed, private vocational school with the State of Colorado sets it apart from other online cooking classes. This vegetarian culinary school requires its Foundation Course students to turn in assignments, meet weekly online and attend in-person workshops, ensuring you're learning. If you're looking for a vegan culinary school online, the School of Natural Cookery is your best fit for web-based vegetarian chef training. Founded in 1983, it has a long track record of success in training vegan chefs. The Foundation Course starts in February and September and you must apply at least 6 months before the start date. The course lasts 8 months and you should expect to commit around 25 hours per week to it. Click here to find out more about the Foundation Course at the School of Natural Cookery. Rouxbe is based completely online and has been running classes online since 2005, meaning whilst it's not as old as some other schools on this list, it's old in internet terms. After running classes online for a decade and a half, you can be sure they've got the technical kinks worked out and are reliable. As you might expect, it's also the most economical option at this list at just $1,299.99 for the plant-based professional course. One thing to note is that Rouxbe is not an accredited institution; however, it is recognised by the American Culinary Federation Education Foundation as quality education. With the Plant-Based Professional Certification everything is based online, meaning you can complete this course no matter where you're located. You'll have 24/7 access to the course, and best of all, you can start whenever you want (you'll have access as soon as you sign up) so you don't have to wait for the term to start. There are 220 hours of course materials online, divided into 18 units and 85 lessons (and over 200 videos) and you'll have personalised instruction and grading. While you have lifetime access to course materials, to receive the Certification of Completion you'll need to finish the course in 6 months. Click here to find out more about the Rouxbe Plant-Based Professional Certification. Based in Mendocino, California, the LIving LIght Institute is perhaps the top raw vegan culinary school in the US. This vegan school as been teaching chefs since 1998. This raw vegan cooking school offers some courses on the essentials of raw vegan cooking online, but their other classes are based at the school in California. The Living Light Institute also offers certification in Mastery of Raw Vegan Cuisine ($6,605), Advanced Raw & Vegan Nutrition ($3,880) and Raw Vegan Artisan Desserts ($3,100). Click here to find out more about the Living Light Institute. Formerly the Natural Gourmet Institute, this vegetarian chef school was founded in 1977 and recently became part of New York's Institute of Culinary Education. If you're looking for a plant based culinary school in New York City that will prepare you for the demands of working in a commercial kitchen, this is it. This vegetarian cooking school is a full-time course, so it's a big time commitment (as well as a big financial commitment, with tuition of $30,500 to $32,500). The plant based cooking school includes 632 hours of instruction (432 in the classroom and 200 in an externship). You can choose between a 6 month program (mornings or afternoons) or a part-time, 13-month course (classes take place on Sundays and Monday evenings). Click here to find out more about the Natural Gourmet Center at the Institute of Culinary Education. While not strictly a nutrition course (it's actual a course on how to go vegan), I highly recommend Brownble's The Roadmap to learn the basics of vegan nutrition from an evidence-based perspective. Run by Kim, a certified plant-based cook and her husband, Carlos, a doctor, everything in The Roadmap is based on a scientific perspective. Looking for a vegan nutrition course? The vegan courses online at Udemy include vegan nutrition classes suited to beginners on vegan nutrition. This vegan nutrition course run by vegan bodybuilder Felix looks good for those who have a fitness or bodybuilding regime as he covers nutrition basics and muscle building. I can't personally vouch for this course as I haven't taken it myself (unlike The Roadmap, above, which I have seen inside and out) but it has good reviews on Udemy. If you are looking to take a vegan nutrition course with the aim of giving nutrition advice, rather than just learning the basics for yourself, then I highly recommend you seek out an accredited program at a local college to become a registered dietician. Having an RD will open up career opportunities. The Vegan RD has an article on how to become a vegan RD here. So, you're looking for a vegan baking course? Learn how to bake all kinds of vegan goodies with these vegan baking classes! Learn from one of the masters of vegan baking, the legend that is vegan pastry chef Fran Costigan. If you wish you could go to vegan pastry school, this course is as close as you can get online to a vegan baking school! I've been lucky enough to see Fran speak and attend in-person vegan pastry courses of hers and she is a master of vegan pastries. This 90-day course consists of 8 units and 200 tasks involving a whopping 200 vegan recipes! The course is on Rouxbe, one of the leading platforms for online cooking courses and you'll received personalised grading and support online. When you complete the Essential Vegan Desserts course, you'll receive a Certificate of Completion. Click here to find out more about the Essential Vegan Desserts course on Rouxbe. This course based on online learning platform Udemy (one of the largest online course providers) will teach you to make mouthwatering homestyle vegan desserts. With one hour of video and 25 downloadable resources, it's not as comprehensive as Fran Costigan's baking class on Rouxbe (see above) but the Homestyle Vegan Desserts class on Udemy looks like an excellent introduction to anyone new to vegan baking who wants to make baked goods for their family. 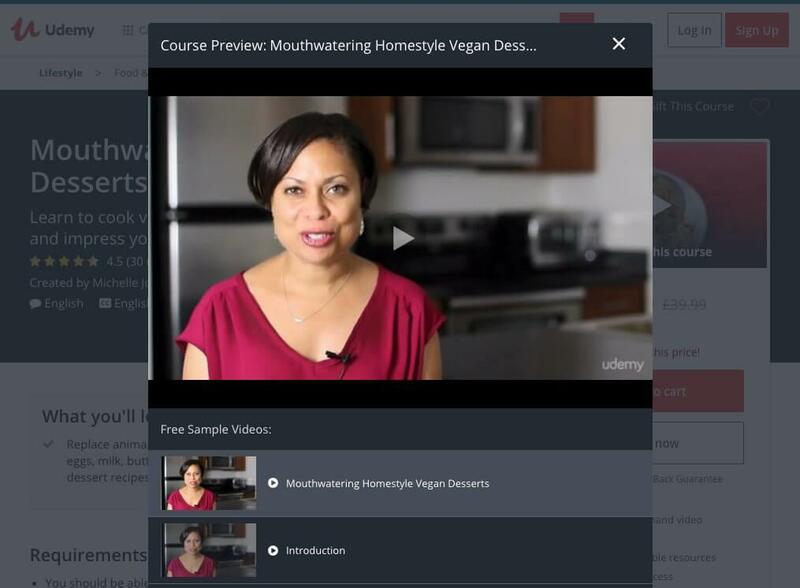 courseWhen you sign up for the Homestyle Vegan Desserts course, you'll be able to access it from any device, anywhere in the world since it's online. You'll also get lifetime access to course materials. Click here to find out more about the Homestyle Vegan Desserts class on Udemy. This article contains affiliate links. That means if you purchase a product/course through them, I'll receive a small commission, at no extra cost to you. Thank you for supporting my blog!